An Interview With Melissa Peterman! You are here: Home / Great Deals / An Interview With Melissa Peterman! This week, thanks to One2One Network, I had a fun opportunity to be able to participate in a phone interview with Melissa Peterman. Melissa played Barbara Jean on Reba. Now she has a new sitcom coming out on CMT. 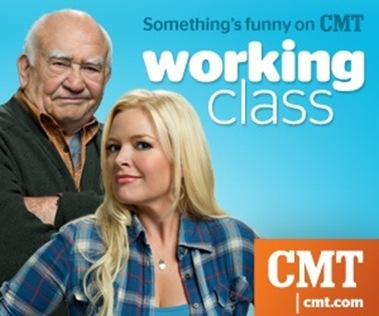 This is CMT’s first scripted show and it’s called Working Class. Ed Asner is her Co-Star! Working Class will premiere this Friday, January 28, 2011 at 8/7c. I got to see the pilot for the show and I really enjoyed it. "Working Class" follows Carli Mitchell (Melissa Peterman), a single mom from a rough and tumble background, trying to give her three kids a better life by moving them to an upscale suburb. She quickly finds that making the transition to “the good life” is harder than she thought. She’s unwittingly befriended by her cranky neighbor, Hank (Ed Asner), her only “career” prospect is a glorified deli job at the local grocery store, and the man she falls for not only already has a girlfriend – but he’s also her boss, Rob (Patrick Fabian). With her ladies-man brother, Nick (Steve Kazee), to help her out (when he’s not acting like one of the kids himself), Carli faces the challenges of parenting, dating, and making friends in her new community by doing more with less, staying true to herself and approaching each day with a touch of working class. Dian: Hi. How are you? Melissa Peterman: Hey, I’m good. Hi, Dian. Dian: Hey, thank you so much for being with us. We really – we’re having fun listening and talking to you, and getting the chance to ask you questions about your new show. I watched it and I absolutely loved it. And I saw on the little (flip cam) things that you all did, how excited you were to be working with Ed Asner, which I can only imagine that that has to be very, very cool. Dian: But I wanted to ask you – yeah, I can just imagine. I heard you talking about it earlier. I wanted to ask you if acting had not worked out for you, what do you think you would have done instead? Melissa Peterman: I think I – well, I always said I wanted to either be an actress or a veterinarian, or a lawyer. But, I think the – in the reality of it, I think I would probably be teaching or doing something with kids. And yeah, I really think that that’s where my heart would – kids are animals, both big passions for me. And I always joke like, “I’m just going to run off and get some land and horse.” But, I think definitely something in teaching. I hoped I’d still maybe be teaching theater in a school or somehow still involved in that, but I think working with kids. Melissa Peterman: I do know. Dian: My Web site is about couponing and saving and shopping. Was there a time where when you first getting started that you had the opportunity to be frugal, and what was – what were some ways that you did that? Melissa Peterman: Well, I’m still frugal because I’m a Minnesota girl, so I’m never a big – I’m a Target girl, so – but I remember when we first moved out to L.A. to give it a go and, you know, toward the end of – before things had happened I – we were paying our rent with those MasterCard checks that you think is a check, but it’s really a credit card, and sort of getting to the end of our rope. But, I’ve always been a bargain shopper, and so for me, the way I do it, if I have the time I love to like go hunt and find the bargain, and I still do. Like, I won’t go to Nordstrom, but I’ll go to Nordstrom’s Rack and then I’ll just like keep, you know, dropping in to see if something gets on clearance and on clearance. But coupons, joining like, you know, Costco. We still do Costco and I guess I’m a big fan – I hate waste, so that – I still hate that. And, you know, I guess I’ve always been sort of aware of it. I mean, I – my dad is an accountant and I’m from Minnesota and it was always like, “You don’t buy what you can’t pay for,” and sort of that so I’ve always had that. And when we first got here, we definitely – we didn’t go out a lot. We – for me it was the was the way to be – the best way that we were frugal when we first moved out here is we didn’t – we cooked at home all the time. We never ate out and never ordered in, so that was probably our biggest thing when we first moved to L.A. and were both struggling. Cook at home. Dian: Yes. Yes, that’s sounds great. Thank you so much. I appreciate your time. So, as you can, there’s no place for me in entertainment news programs! You can follow CMT on Twitter, or "like" them on Facebook and never miss an update. You can see clips from the show here! I love Melissa Peterman. Did anyone ask about her weightloss and how she maintains it? @Penny =^.^=: No, I don’t remember anyone asking her about that! Good question, though!